Women today have a lot to deal with. Modern conveniences have made life a bit easier, but there are still numerous challenges to deal with on a daily basis. 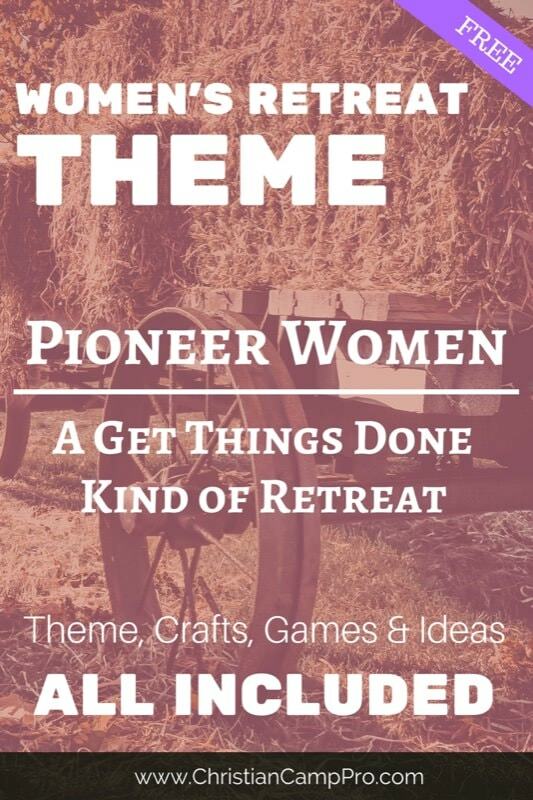 A Pioneer Women ladies’ retreat can be a useful way to encourage ladies of all ages and backgrounds to fearlessly follow God and find purpose and meaning in His plan for their lives. 14 Every wise woman builds her house, but a foolish one tears it down with her own hands. Building a structure out of the proper materials is challenging enough, but how about building a tower out of newspapers? This game encourages ladies to work together and think both logically creatively in order to create a tower from newspapers. Provide plenty of old newspapers and tape and set a time limit. The team with the tallest standing tower wins. You can award prizes for the most creative and the best use of materials as well. 9 Also, the women are to dress in modest clothing, with decency and good sense, not with elaborate hairstyles, gold, pearls, or expensive apparel, 10 but with good works, as is proper for women who affirm that they worship God. Women like to look good and in today’s world of Instagram stars and Facebook tags, looking her best has become even more important. Ladies are told that in order to be socially acceptable, they should look a certain way, dress a certain way, have this hair or that makeup. It’s impossible to keep up with all the trends! Use the scripture from 1 Timothy to help ladies understand that what they wear on the outside is not nearly as important as how they conduct themselves and represent their heavenly Father. It’s okay to “glam-up” once in a while, but our focus should be less on our outward appearance and more on what we do in the name of Christ. The book of James calls the human tongue “untamable.” Like an unbroken horse, it can run wild if not kept in check. The world is full of gossip: celebrity magazines, reality television shows and social media are rife with less-than-edifying speech. Even in our churches, prayer requests can take an ugly turn and lead to hearsay and so-called “back fence talk.” The verse above should be used as a reminder to ladies to keep their speech wholesome and uplifting. Everyone probably played this game as a child. It was fun to see how much the original message got distorted the further it went down the line. The concept is still the same in this version. Use the suggested phrases or come up with your own to teach the importance of thinking before we speak and keeping our conversations free of gossip. Aren’t you glad we no longer have to rely on candles or oil lamps to light our homes? Candles these days are mostly for decorations or to make a room smell nice. This craft combined simple tea lights or other small candles with Mason jars. Black or colored chalkboard paint dresses up with jars and creates a surface that can be written on. Attendees can decorate the lids with twine to personalize the jars. Fortunately, we don’t have to make every single article of clothing by hand anymore. However, clothing emergencies happen: buttons fall off, seams come loose, rips and holes occur. This craft creates a cute a practical way to keep those sewing supplies handy. Provide an assortment of threads, buttons and other sewing accessories and allow the ladies to assemble their kits and decorate the jars to their tastes. This craft is one everyone is sure to appreciate as it uses simple items like baking soda, an old Parmesan cheese can lid and a Mason jar (notice a trend?) to create a useful and personalized deodorizer for the home. The scents can be easily customized using essential oils. The containers are customizable too. Provide old buttons, twine or chalk paint for the ladies to use to decorate the Mason jars. What was the name of Moses’ sister? Which female judge described herself as “a mother in Israel”? Find out in this fun Bible quiz game. Use the questions in the link or come up with your own to test your attendees’ knowledge of Pioneer Women of the Bible. No retreat is complete without a fun take-home gift. This survival kit is full of things every woman can use. Put all the small items in an empty breath mint tin and hand the kits out as parting gifts or door prizes. Being a woman of faith in today’s society can be challenging. It takes the strength of character and a deep trust in God to navigate around the pitfalls of modern social ills and immorality. A Pioneer Women retreat can be a useful tool in helping women learn and understand what it truly means to be a follower of Christ.